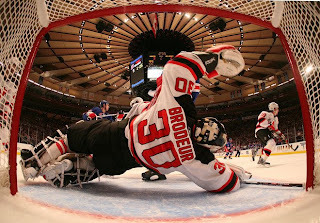 Call it 'Rookie Ranger Redemption' or just simply call it 'Making Marty Brodeur Eat Dirt.' Whatever suits your fancy, newcomer Marc Staal scored the third and goal-winning goal, a beautiful slapshot that slipped underneath NJ Devil goaltender Marty Brodeur's pads -- even this one MAAARRRTTTTYYyyyyy admitted to the press was a good shot and "sometimes they get past us", referring to the plural use of 'us' - meaning the entire team let a great shot through, not Brodeur himself. Typical. Official recap here. The game last night was solid 'old-time' hockey -- good hits, going to the net for dirty goals and high scoring, despite what most people expect from these defensive-mind franchises. Unlike the first and second games of this series, Coach Tom Renney let the Blueshirts take to the net -- special mention goes to our rookies out there: Staal with his first playoff goal against the 'Greatest Goaltender Ever...and ever...and ever....', Dan Girardi contributed remarkable blueline coverage, and Ryan Callahan and Brandon Dubinsky were everywhere the puck was -- relentless, physical and a threat to those 'Sutter Demons of Louie.' NJ Devil General Manager 'Lucky Louie Face' may be ready to fire Sutter before the fifth game, sending a negative message to all AHL coaches throughout the land. Place your bets. The New York Rangers now lead the first-round of the post-season 3-1, the fifth game tomorrow night; we all hope our Blueshirts will close the series Friday at the beautiful 'Prudential' home of the Newark Devils (when walking from the train to the arena, speak softly and carry a big hockey stick). If we close out the series, we can expect to meet the 'red-hot' Pittsburgh Penguins, starring the second-biggest-whiner-to-Brodeur, The Kid Known as Sid (Crosby). No one could have expected the in-season powerhouse of the Ottawa Senators would have been sweeped by the Penguins in the first-round, when most expected Ottawa to take the Eastern Conference and be a true contender in the final round. Truth hurts. Weak goaltending (Gerber) will end any playoff run. The atrocious officiating, on the other hand, absolutely erodes the integrity of the game. The Devils' 3rd goal in game 4 should have never occurred. The play should have been blown dead when Parise clearly and intentionally interfered with Lundqvist by knocking Lundqvist's stick out of his hands. Instead, the Devils are allowed to tie a pivotal game relatively late in regulation. This non-call could have easily changed the out come of the game AND the series. That's just unacceptable. I couldn't agree more, Rabbi. I do think Joisey's had a 'bug up their turnpike' since the first playoff game in Newark, when in the last minute of play they were unfairly called for hooking. That may have changed the course of the series in their favor, but that is the Devil's Advocate point of view- and who cares about anything related to the Devils anyway? 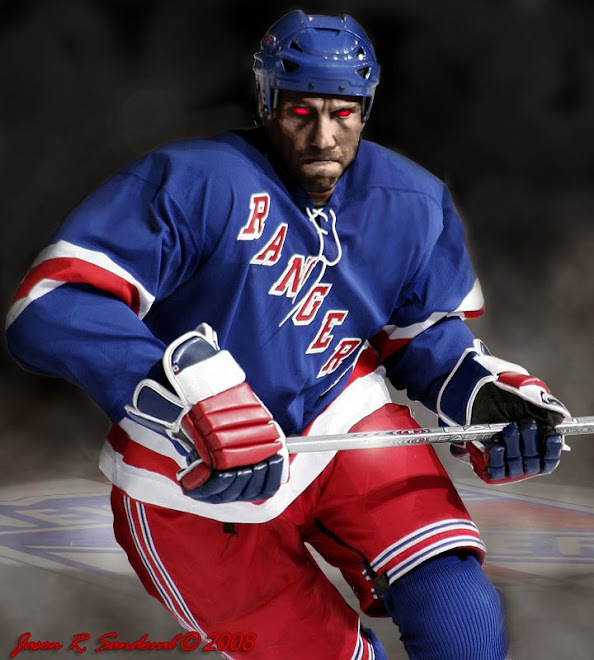 Tune in tomorrow night on MSG (7pm EST) when the New York Rangers hopefully close-out the first round and force all of us to absorb the double-cost of the second-round playoff tickets. Worth every penny. The Devils' crying over the phantom hooking call late in Game 1 is a joke. Even if the penalty was not called, who knows whether Jersey could have scored. It's way too speculative. Additionally, what prevented Jersey from re-establishing themselves in Game 2 the way the Rangers did in Game 4 after loosing game 3? The bottom line is that the non-call on the Parise interference directly lead to a goal in the SAME PLAY. Unacceptable. 1) If recent history is a guide: Had Avery done what Parise did then the NHL would be announcing a new 'directive'(rule) this afternoon. 2) IF it is a Ranger-Pens series both teams better be prepared for MUCH tougher competition than they saw in the first round. The Senators were dead BEFOE the first game. People can cry over bad calls and unfair plays (Avery) but the numbers speak for themselves. Congrats on Moving on up Rangers.